If you're in Barcelona, Paella and Sangria is the perfect combo meal, and where else to try their best cuisine & cocktail in town, well here's my discovery to try it all out- Patagonia Barcelona. This restaurant is located along the La Rambla Barcelona very close to where we stayed at Sheraton Hotel Barcelona. The place was quite small just enough to feed less than 50 people but the ambience of this food haven was really memorable. You have the view of yhe crazy crowd along the streets of Barcelona while inside you'll have the live football game with all the customers obviously enjoying all the Spanish local delicacies available from their menu. 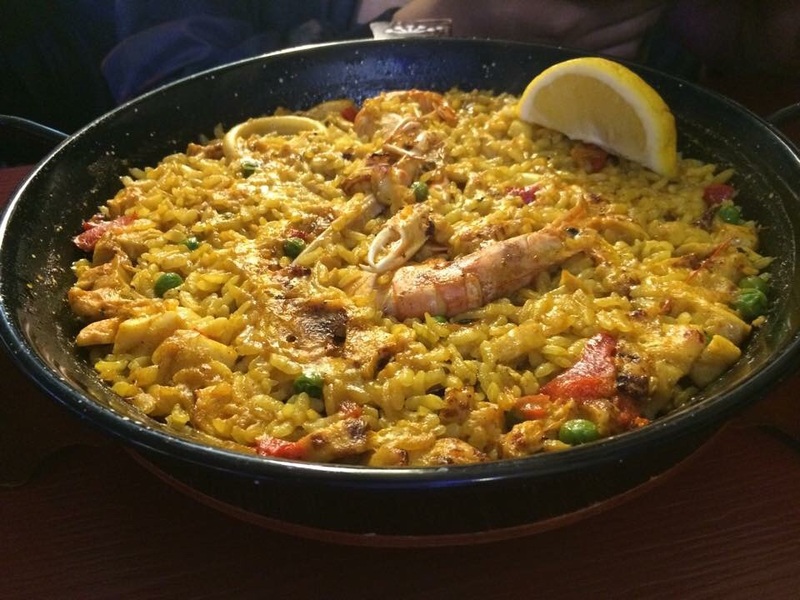 You definitely have to try their Seafood and Paella Negra. It's the best choice that we had and ordered the classic Sangria that was indeed authentic & flavourful. We were from Sagrada Familia and Barcelonata Beach that day and we were so hungry that we finished it in 15 minutes. It's definitely worth the bills we paid for and will definitely go back here in future given the chance to visit Barcelona again. Welcome to the world's most renowned park located in Barcelona, the famous Park Güell (Catalan: Parc Güell) is a public park sytem composed of gardens and architectonic elements located on Carmen Hill in Barcelona Spain. The design of the park was done by Antoni Gaudí, a world famous Spanish architect and the face of Catalan modernism. 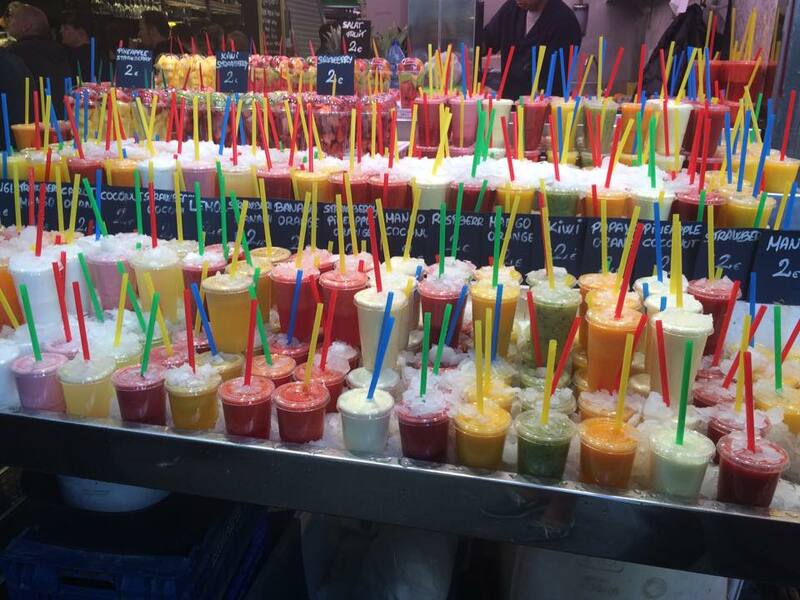 Welcome to the world's biggest market place in the world, La Boqueria Mercat Barcelona! This is Spain's largest and craziest tourist destination that will definitely satisfy your taste buds, especially for food lovers out there, this place will be your piece of heaven on Earth. The variety of food selecetions here were totally limitless in terms of local food delicacies and Spanish cuisines. You'll have the hardest decision of your life in deciding whether which one to try first, from tapas, quiche, cheeses, cured meats, wine and even fruit parfaits, popsicle & even freshy squeezed one, they have it all here! La Boqueria is definitely the best spot you have to try in Barcelona! La Rambla Barcelona known of its lively and crowded tourists strolling along its historical and eye- catching architectural structures of Barcelona. It's like walking along Intramuros area where you'll like a big Spanish museum where you'll see more of their cultural heritage. 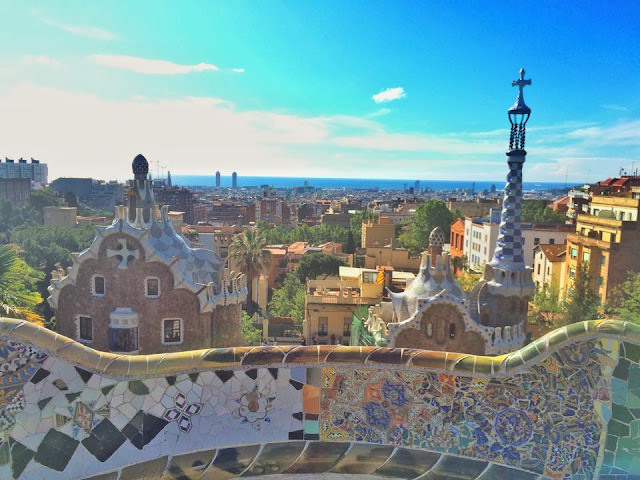 Barcelona is definitely a top spot of all the cities of Spain that you surely don't wanna miss. In terms of local foods, tourist destinations, and world's best heritage site, Barcelona will have the best of what you're looking for in Spain. CentOnze Restaurant is such a memorable place for they have the best and crispiest churros I had so far in my entire life. That creamy chocolate dip & near to perfection churros was the perfect Spanish dish for me. This restaurant is located inside the Le Meridian Hotel Barcelona, and got the chance to have a breakfast buffet here. 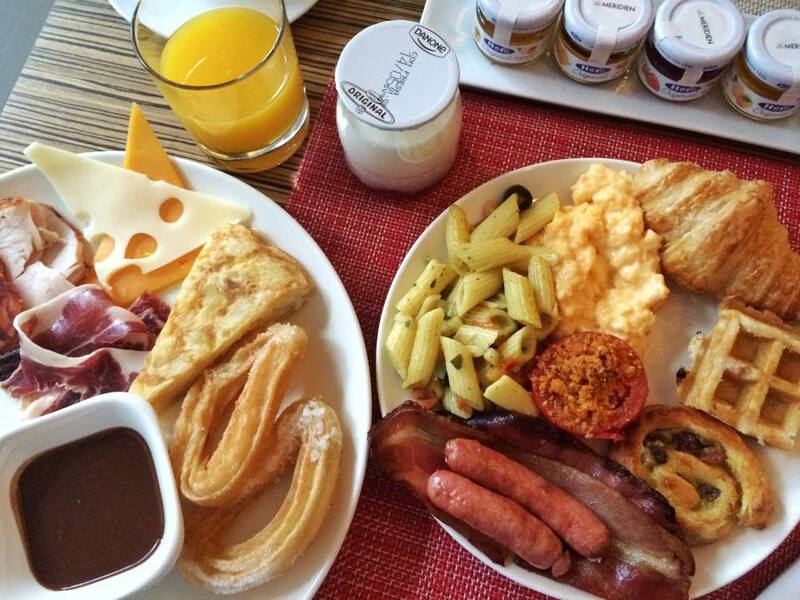 I mean who will not wake up early to have unlimited tapas, freshly baked breads and crispy churros to start the day. I know the binge eating experience I had here but it was all worth the calories intake. I just love the resto ambience, friendly staff and the variety of food offers they have for the breakfast menu from pasta, bread, rice and even the Spanish local desserts. Don't forget to try their hot milk chocolate drink as well! Welcome to Le Meridien Hotel Barcelona! The best hotel located in the heart of La Rambla famous in Spain! The location was excellent and the room was indeed great. Le Meridian Barcelona located in the city's famous Las Ramblas is a five star hotel that is perfectly positioned near to some of Barcelona's famous museums, architectures and historical tourist attractions. 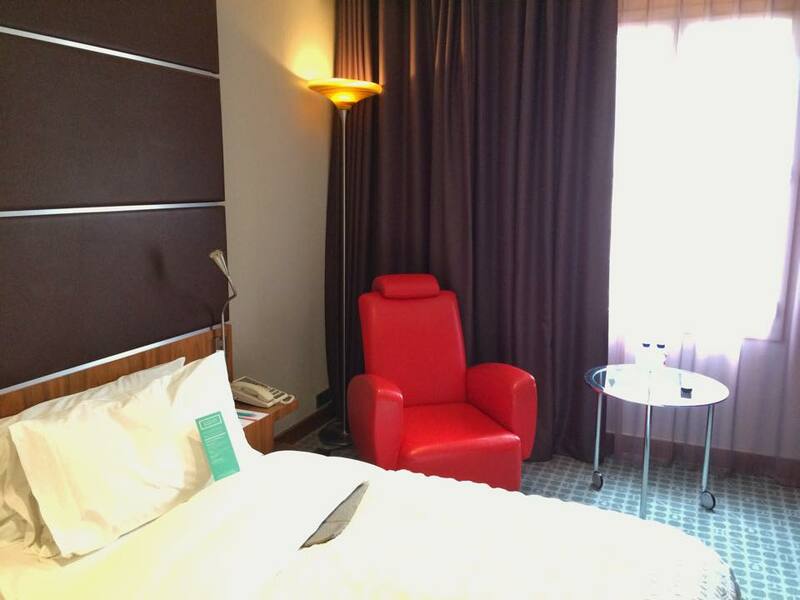 Hotel rooms are furnished with contemporary designer pieces with various art installations from local Spanish artists. 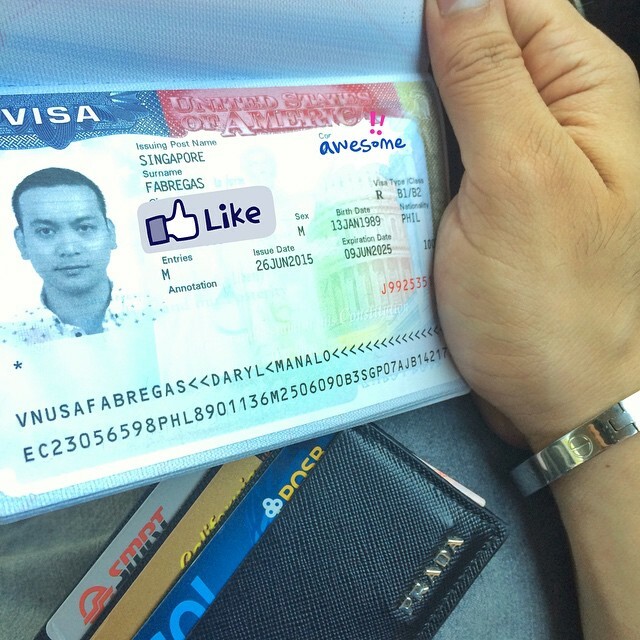 The staff were customer service friendly who even assisted as where to get the best tapas and booked online our Park Guell & Sagrada Familia Church without any hassle. You also have to try Le Meridian's HUB located in the central lobby with a fanstastic environment to relax and unwind with family & friends. You also have to check out the Longitude 02' 10 " Bar for some coffee and dessert and have your breakfast buffet at CentOnze Restaurant. So for your best stay in Barcelona, there's no other better place to offer you the best stay than Le Meridian Barcelona. Wish you were beer! That's the quote I always remember while we were on this cozy bar on our first day in Barcelona Spain. Since our hotel was strategically located along La Rambla area, it was the perfect spot for some of the best paella, tapas, beers & sangrias, thanks to Sheraton Hotel for recommending us this place, just few steps away from the hotel. 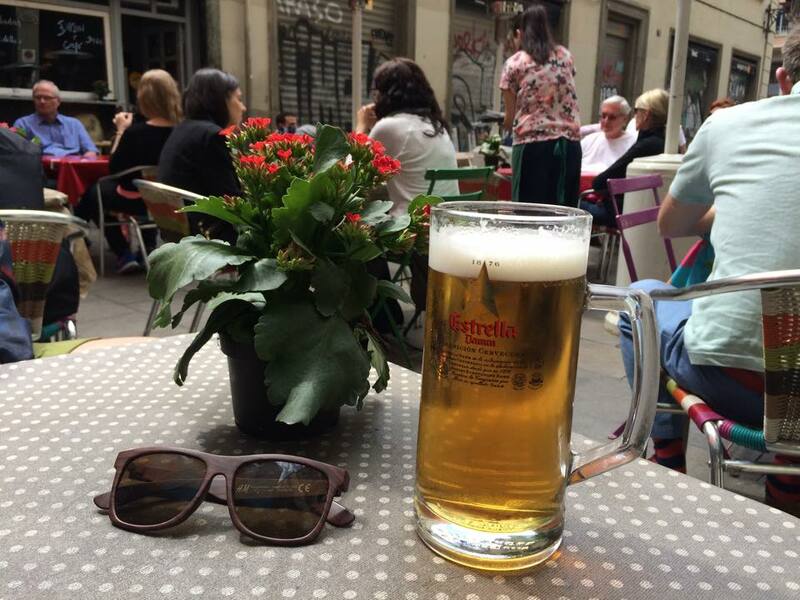 Of course, I had to refresh myself with beers and tapas from to early flight from Paris that day. Since my beloved country was colonized by Spain ccording to history (LOL!) 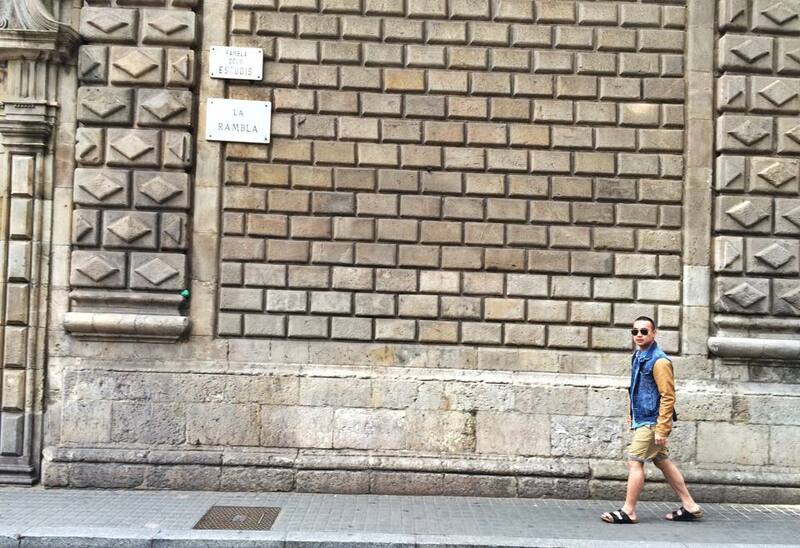 I felt so at home in Barcelona. This bar was the first food place we've tried and we definitely gave it a thumbs up. The Al Fresco feel of this humble bar situated along the main street plus their wide varities of tapas and cocktails were just awesome. We ordered mixed tapas, beers and sandwiches for late lunch and we left the bar with a smiling tummy! 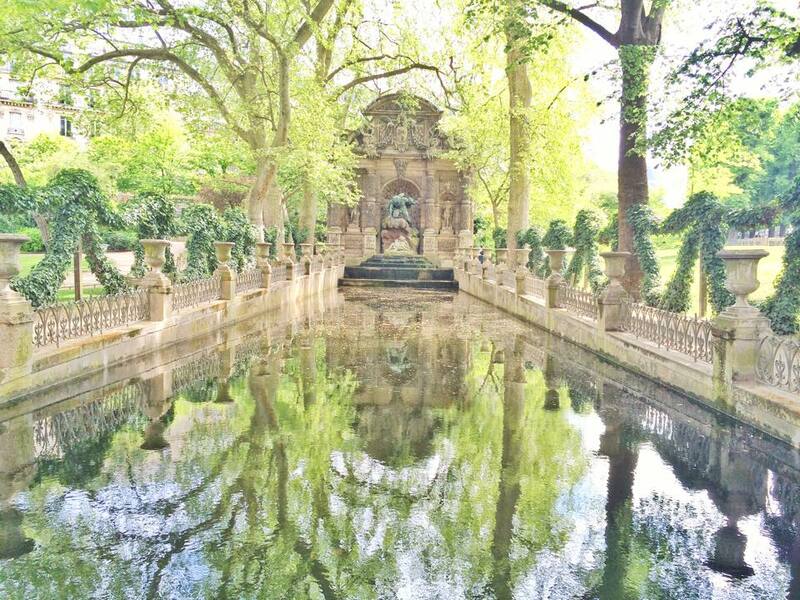 Luxembourg Garden of Paris is probably the best dream-like garden I have ever visited in my life. This garden built in 1620 is owned now by the French Senate and covers 23 hectares of tulips, lawns, tree-lined promenades and flowerbeds. Just standing in front of the Luxembourg Palace, strolling along the picturesque flowerbeds made of tulips, or just simply taking a seat along the park and basking under the heat of the sun while savouring your gelato cone, this place is the perfect spot for nature lovers. Every corner provides a rich historical background of France. No wonder why people easily fall in love with Paris, it's indeed a romantic place to be. And it's a free entrance so you better visit this place in the morning, perfect for a morning cardio or afternoon picnic too. Happy Monday from Paris with LOVE! 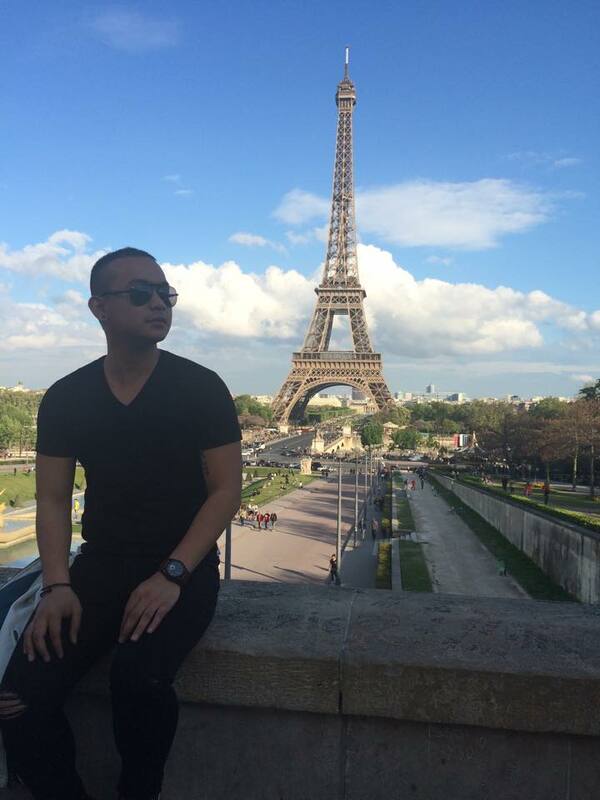 This will be my second to the last blog post of my Paris travel escapade. The upcoming Spain travel & food blog posts will be out soon and I realized there's more to Paris aside from its famous Eiffel Tower and Louvre Pyramid. In this blog post, I compiled some of awesome tourist spot you shouldn't miss in this romantic city. The famous architectural wonder in Paris known as the "Pantheon" must be on anyone's travel itinerary. The "Love lock bridge" along Seine river and "Jardin de Luxembourg" are also Instagram worthy tourist spot. It's even more amazing to think that anywhere you go, every corner and streets in Paris were sincerely picturesque. If I will be given the chance to visit Paris again, I will stroll all day long, spend hours on cafehopping, go shopping til I drop and live my life with love the Parisian way! 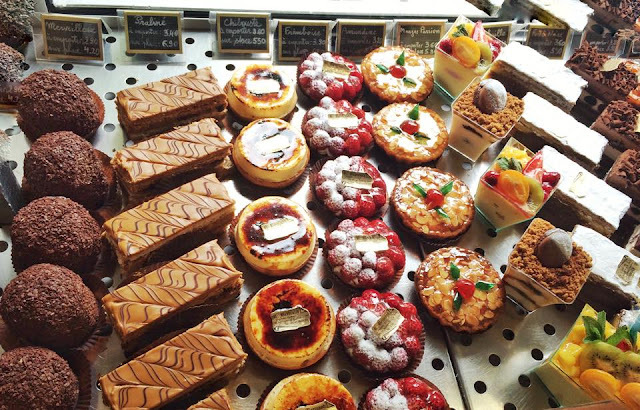 Les Cakes De Bertrand is just one classic fancy Parisian cafe that we have tried in France recently. After strolling around the gardens and parks in Paris, we decided for a coffee break before heading to Notre Dame Church. The pastries and short cakes here were to die for. I've tried the best chocolate eclair and hot choco drink here as well. My eyes popped out for the biggest colorful meringue I've seen in my life so far. When in Paris, cafe hopping is the best thing to do. So go on on continue to explore the world!